2. In a medium-size bowl, whisk together the egg whites, ¼ cup Parmesan cheese, salt, pepper. 3. Trim the BroccoLeaf stems where they meet the leaves. Roll the trimmed leaves lengthwise so they resemble a rolled cigar. Holding the roll with one hand, slice the leaves crosswise into thin ½” wide “noodles”. 4. Heat a medium-size non-stick sauté pan or cast iron skillet; 9-1/2 inches in diameter is best. Add the Broccoleaf “noodles” and water, cover and steam for 2 minutes. When the BroccoLeaf is soft and bright green, Add the olive oil, sundried tomatoes, olives and half the fresh basil. Stir to combine. 5. Brush the sides of the pan with a little extra olive oil to prevent sticking and pour in the egg white mixture. Stir constantly over medium-low heat as you would for scrambled eggs, just until the egg whites begin to set, about 5 minutes. 6. When the egg whites are set around the edges, but still loose on the top, drop 6 to 8 spoons full of ricotta cheese randomly into egg mixture. 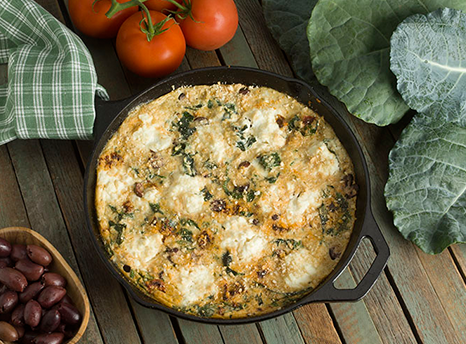 Place the pan in the preheated oven and bake for 3 to 4 minutes, or until the top of the frittata is firm to the touch. Loosen the edges of the frittata from the pan with a rubber spatula and slide it onto a cutting board; or serve it directly from the skillet. 1. Trim the BroccoLeaf stems where they meet the leaves. Reserve the stems for fresh BroccoLeaf juice. Roll the trimmed leaves lengthwise so they resemble a rolled cigar. Holding the roll with one hand, slice the leaves crosswise into thin ½” wide “noodles”. 2. Heat a medium-size non-stick sauté pan or cast iron skillet; 9-1/2 inches in diameter is best. Add the olive oil and heat just until it ripples. Add the garlic, stir and sauté just until it begins to caramelize. 3. Add the BroccoLeaf “noodles” and water, cover and steam for 2 minutes. 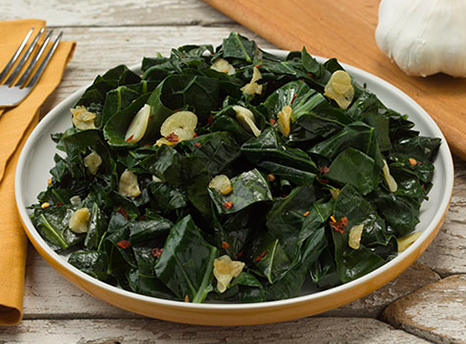 When the BroccoLeaf is soft and bright green, season to taste with crushed red chili flakes. Heat 5 tablespoons olive oil in a large skillet over medium heat. Saute onion, green onions and garlic, until soft and lightly browned, caramelized. Remove from heat and let cool. In a large mixing bowl, stir in broccoleaf and parsley and cooled caramelized items. Mix in eggs, ricotta, and feta and stir so all ingredients are blended. Lay 1 sheet of phyllo dough in prepared baking pan, and brush lightly with olive oil. Lay another sheet of phyllo dough on top, brush with olive oil, and repeat process till you’ve used 8 sheets of phyllo. The sheets will overlap the pan. Spread spinach and cheese mixture into pan and fold overhanging dough over filling. Brush with oil, then layer remaining 8 sheets of phyllo dough, brushing each with oil. Tuck overhanging dough into pan to seal filling. Bake in preheated oven for 45 minutes, until golden brown. Cut into squares and serve while hot or cold. Can be prepared a day before. To make the sauce, in a heatproof bowl set over a pot of simmering water, combine the egg yolks, lemon and lime juice and water and whisk constantly until the mixture begins to thicken, then continue whisking for about 1 minute more, but remove the bowl from over the pan as soon as the mixture thickens. Add the sea salt, pepper and cayenne pepper or chilli powder. Continue whisking the sauce while slowly pouring in the melted butter in a thin stream until incorporated, about 2 minutes. Taste and adjust the seasonings. Cover and keep warm over very low heat until ready to serve. Lightly spread the cut side of each muffin with 1 tsp. of the softened butter. In a sauté pan over medium-high heat, melt the remaining 1 tsp. butter. Add the torn broccoleaf and cook until slightly wilted, about 2 minutes. 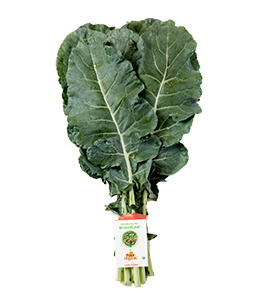 You should have about 1 ½ cups cooked broccoleaf. Keep warm. Fill an egg-poaching pan with ½ inch water, set the pan over medium heat and bring to a simmer. Lightly coat the poaching cups with nonstick cooking spray and crack an egg into each cup. Cover and cook until the whites are firm and the yolks are glazed over but still soft, about 3 minutes, or until done to your liking. Transfer the eggs to a warmed plate and repeat with the remaining eggs. Place 2 muffin halves on each of 4 warmed individual plates. Top each muffin half with some of the spinach, an egg and some of the sauce. Serve immediately. Serves 4. Heat the pancetta in a large pot set over medium-high heat. Saute the onion in the pancetta mixture, stirring often, until the edges begin to brown, about 5 minutes. Add the ham hock, smashed garlic, chicken stock (vegetable stock) and water and bring to a simmer. Cover and cook for 1 hour. Preheat oven to 350°. Butter or spray a 13x9x2 inch baking dish and set aside. Place bread in a single layer on a baking sheet. Bake until toasted and dry, about 20 minutes. Let cool and transfer to a large bowl. Heat butter in a large skillet over medium high heat. Add onion and shallots with a ¼ teaspoon of sea salt, and cook until softened, about 10 minutes. Add celery and BroccoLeaf and cook for 5 minutes more. Add sage, thyme, rosemary, salt, and pepper, cook another 2 minutes. Add to bowl with toasted bread and mix in parsley. Add hot stock (stock must be hot) and toss gently, don’t over mix. Transfer stuffing to prepared baking dish and dot with butter. Bake on middle rack until deep golden brown on top for about 30 minutes. Let sit 5 to 10 minutes before serving. Stuffing can be prepared ahead and baked the following day. Mix the BroccoLeaf, cabbage, carrots and red onion in a medium sized bowl. Reserve the almonds and cranberries. In another bowl, whisk together the vinegar, sugar, mustard, canola oil, salt and pepper. Pour over slaw mix and toss to combine. Add the almonds and cranberries. Heat oil in a large pot over medium heat; cook leeks and shallots, with a pinch of sea salt until soft, about 5 to 7 minutes. Add the cauliflower and vegetable stock to the leeks. The stock should almost cover cauliflower, adjust and add a little more if needed. Bring to a boil over high heat. Reduce heat to low, cover and simmer until cauliflower is just tender, about 10 minutes. Puree soup in batches with the miso in a blender until very smooth, adding more vegetable stock or coconut beverage if it's too thick. Season with additional salt and pepper if desired. Garnish with a drizzle of olive oil and chopped chives. Butter a 8 inch round baking dish. Place a large sauté pan over medium heat and add the butter. When butter is melted, add leeks and salt. Cook, stirring occasionally until the leeks have softened. Add all of the BroccoLeaf with the vegetable stock and cook, stirring occasionally until the BroccoLeaf has wilted, about 8-10 minutes. In a small mixing bowl combine the cream, half and half and the rice flour. Whisk until smooth. Pour into the BroccoLeaf mixture and stir while cooking for about two minutes, or until the mixture has thickened. Transfer mixture into the prepared baking dish. Top with pecorino cheese. Place in the oven uncovered for about 15 minutes, until the cheese is browned.